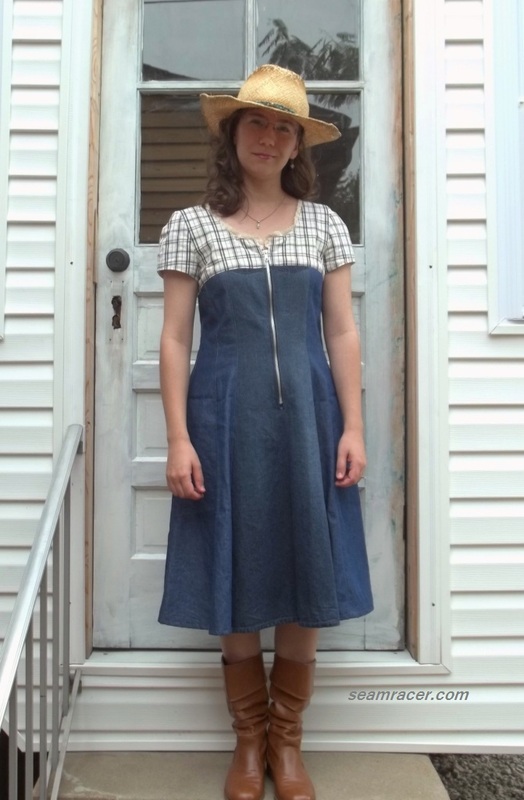 This dress is about 2/3 refashioned, 1/3 regular fabric store remnant, and 100% creativity between myself and my husband. 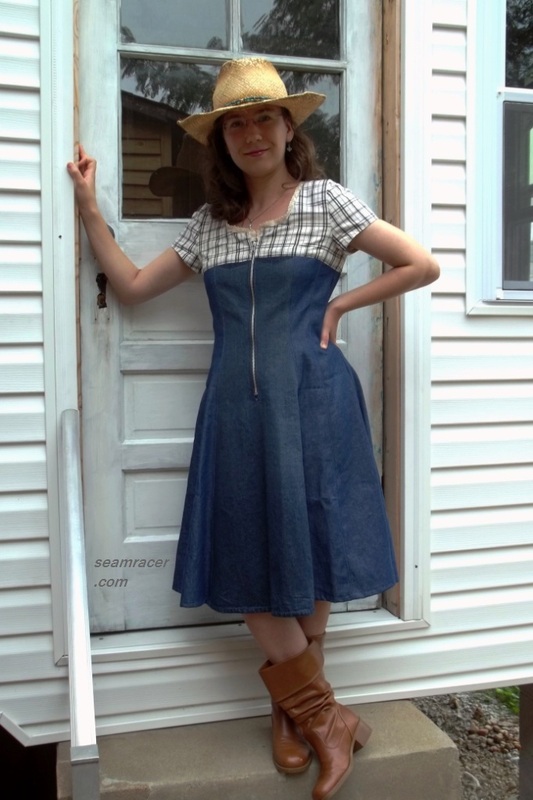 What is so cool about this dress is that it’s not “in-your-face-western”, but subtle enough to suggest a feminine twist on the days when plaid was a staple for cowboys and denim was the next toughest thing to rawhide 🙂 Never intended this…it’s just how it came together…but y’all know that I love a refashion project! I don’t technically know how this project started. 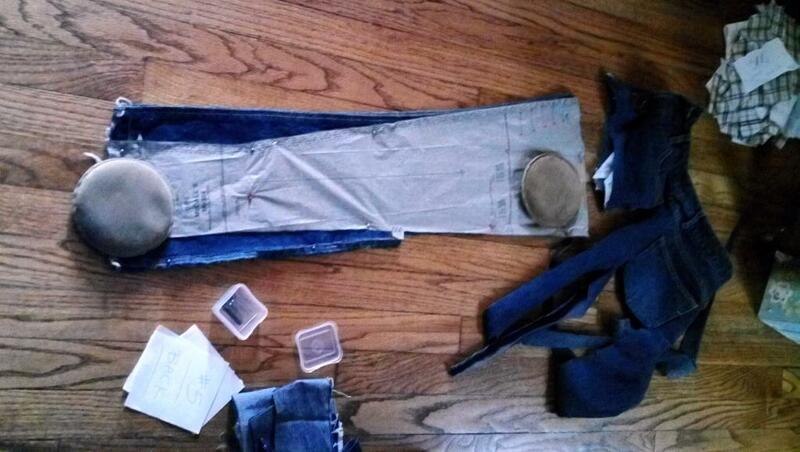 I had a yard of denim floating around the basement and a lingering pattern idea which I was determined to make work. This dress was made from McCalls 6324. Now, I knew I wanted the short sleeves of view C, with the contrast bodice of view B, and the ‘no-contrast’ bottom hem of view A. Ah, the wonders of a designer’s inspiration! I love mix and match features on patterns. FIRST WORN: to see a movie (“Pirates” in Clay-mation) with hubby at the same place where we had our first date. This is a wardrobe staple kind of dress, though! Our little dachshund (my little shadow and constant companion) is in this picture! However, when I laid the pattern pieces out, I realized I only had enough fabric for 4 of the dress panels. I did laugh at myself at this point for completely disregarding the amount the pattern said was needed. The dress is put together with 6 panels front, and 6 panels back, and I really didn’t feel like running all over to our fabric stores for something matching. I did happen to remember I had an old pair of flare leg jeans (never really worn) that never fit quite right. I planned on giving to Goodwill. Luckily for me, I hadn’t donated them yet and was able to find them again without too much digging. The denim of my jeans was a perfect match-just close enough to work and besides, I felt good about up-cycling into something more useful and fashionable. These jeans weren’t an easy answer though. We were going to have to use a lot more inventiveness. Above is the pants turning into my dress. The dress panel pieces were a little too long, so I used my seam ripper to take apart the pants’ hem, pockets, and side seams from knees down. For best look, I figured on using my jeans for the 2 middle front and the 2 middle back panels. I threw my own and my husband’s caution to the wind and go for a wild idea. The undone hem of the front pant leg panels was used along the bodice seam for the 2 center back panels, while the back jean legs were used for the 2 front dress panels with the darker marking from the missing pockets along the bodice seam also. Here are close ups of what I did. The right is the front of my dress, while the left is the back. My husband practically gave me the bodice idea. I was digging through my fabric stash for a good contrast fabric, when he mentioned ‘plaid’ (which he loves) and I went to a bin where we keep all his old ‘rag shirts’, which normally have a stain or a hole in an obvious place. I could cut around something stained, so I thought. Then my husband pointed out an old Eddie Bauer shirt he wasn’t going to wear anymore. He’d had this shirt since late high school, and his mom had already shortened the sleeves a long time ago. By the way, this shirt was a generous fit – it is from a time when he was, let’s say, a lot more optimistic about his future body size. He is – and always has been – a skinny guy! I used the bottom front and the bottom back (with careful matching) for my bodice, and I used the shirt sleeves to cut out my new sleeves. Then I lined the whole bodice in a soft white 100% cotton scraps in my stash. 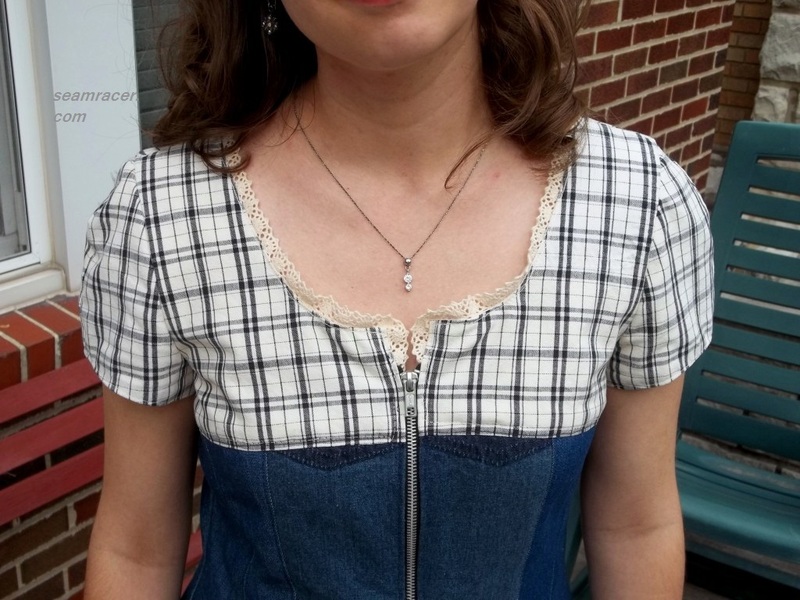 I’m quite proud of how nicely the bodice is lined and how well I matched up the plaid across the front. Hubby’s plaid made my dress’ ‘look’ seem a bit tough, so I went and bought small cotton lace for the neckline without having the dress on hand with me. I eye-balled how much I needed and I was only 7 inches extra! Hot dog! The exposed zipper was so easy and fun to put in the dress. 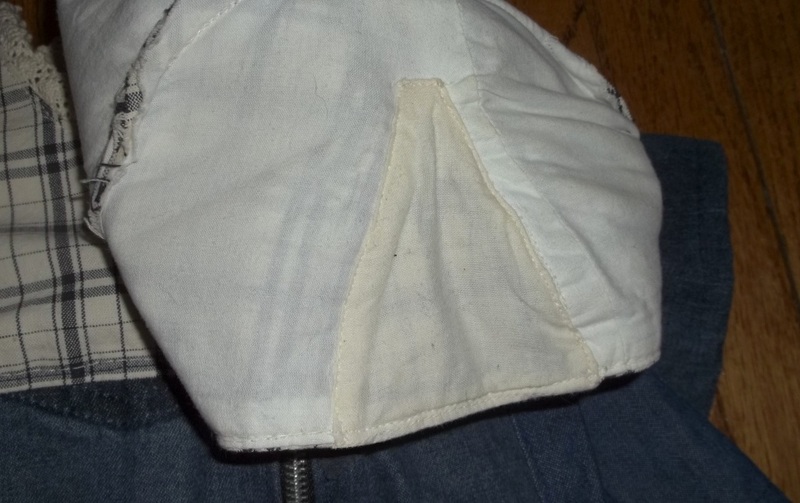 For an added touch, I even added a small panel to cover the inside bottom of the zip. 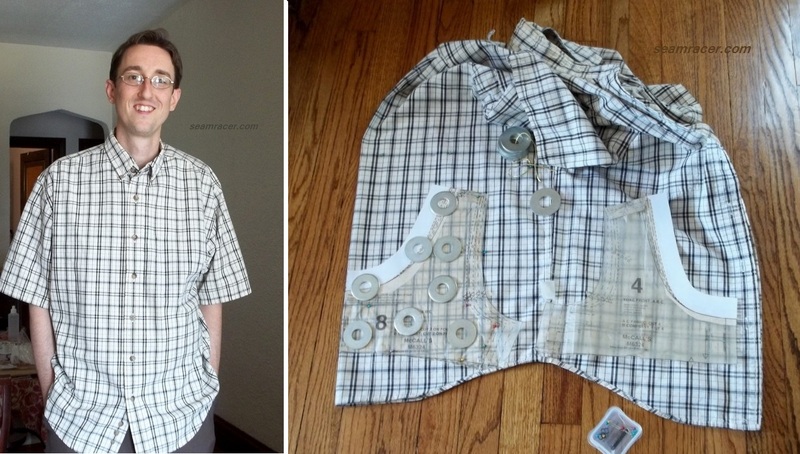 I feel my 2nd refashion was another unique success, and my husband loves to tell others about this project, as it was partly his in it’s own right. I’m also glad I saved two items from floating around Goodwill. As of May 2014, I have made those changes and additions I considered above! First, I had to give myself more room in the arms. Thus, I dug back through my scrap pile and found some more bits of the plaid. Sadly, I did not have enough for newly cut full sleeves. I had to adapt what I had on my dress already. Perhaps I should have done underarm gussets, but I do not as yet feel experienced enough to do such a detail..
My first step was to cut though the center top of the sleeve from the hem to almost the shoulder top. Then I filled it in with a godet-style piece. I had to line those sleeve godets in plain cotton, just like the rest of the insides, to make my change clean and not messy. This might not have been the smoothest means to give myself reach room, and it does mar the plaid, but I did match up as best I could! My dress is so much more easy to move in, so I’m counting this as a win! 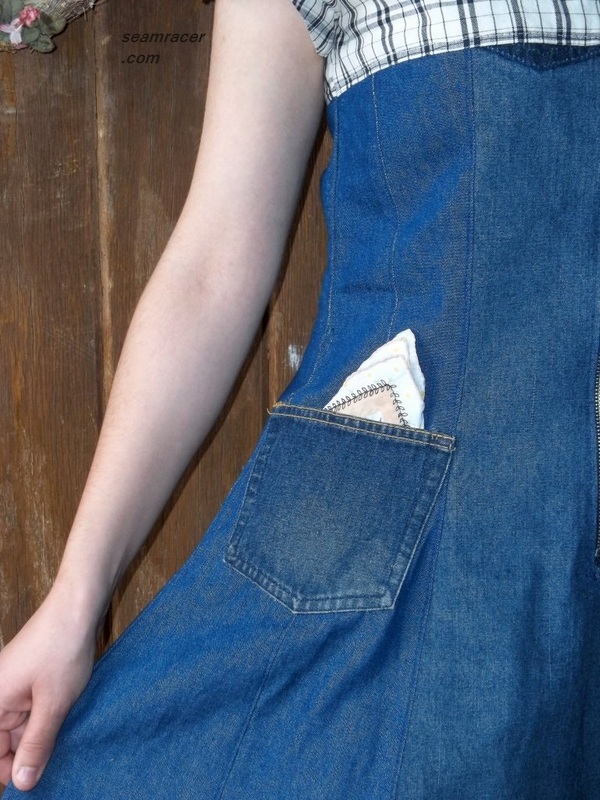 Then, because a garment is always better with pockets, I also found the leftovers from the jeans I used for the body of the dress and added the one of the former booty pockets to the side front of my dress – perfectly hand handy now! 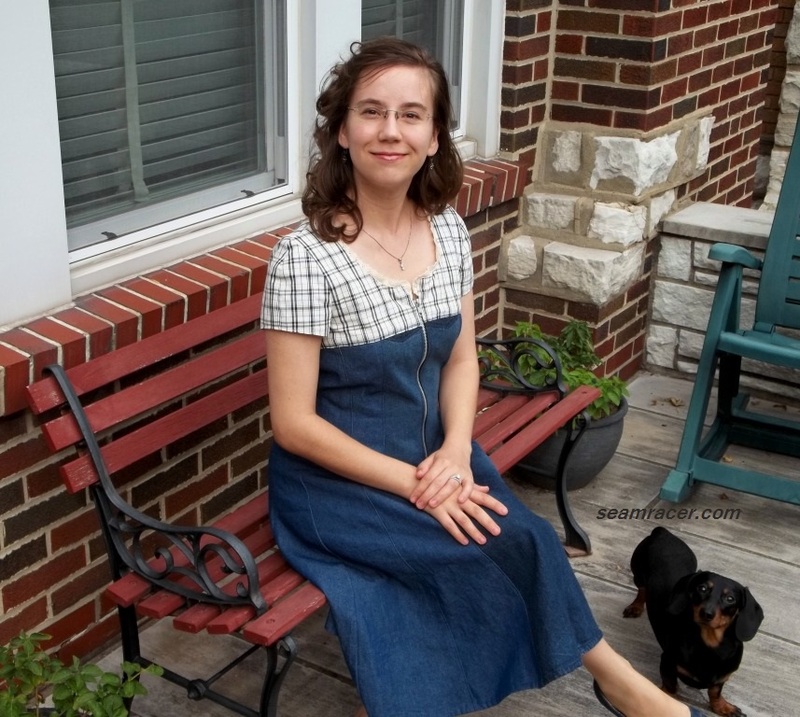 This entry was posted in Modern and tagged "exposed zipper", "McCall's 6324", "McCall's pattern", cotton, dachshund, denim, dress, jeans refashion, lace, plaid, re-fashion, western dress by kellycb. Bookmark the permalink.